Drive the Imperials from Skyrim. Leveled weapons, leveled gold, leveled armor, a full suit of Stormcloak Officer Armor, the ability to buy a house in Windhelm, the ability to become Thane of Windhelm. "We'll drive out the Empire from this land that we own. With our blood and our steel we will take back our home." This quest governs the overall progress of the Civil War for the Stormcloaks. It is completed by doing a series of other quests that are assigned to you as the Liberation of Skyrim progresses. 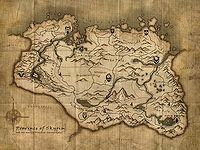 The overall goal of the quest is to conquer each hold of Skyrim, one at a time, by taking control of the military fort for each hold. The holds to be conquered are altered by negotiations during Season Unending, and therefore there are many possible ways to complete this quest. Without doing Season Unending, only the Imperial-controlled holds in the following table need to be conquered. The Stormcloak-controlled holds only need to be conquered if given to the Imperials during Season Unending. The Imperial-controlled holds will not need to be conquered if taken from the Imperials during Season Unending. Also, if you do Season Unending, then this quest will be put on hold until you have completed the main quest. After you defeat Alduin, then you will be able to continue with this quest. Haafingar Imperial Haafingar Stormcloak Camp Haafingar is always the final hold that needs to be conquered. One final complication is that when you complete the quest Dragonslayer during the Main Quest, any hold (other than Haafingar) that you have previously been tasked with liberating is immediately transferred to Stormcloak control. All remaining quests for that hold are skipped, and you need to return to Windhelm to receive the next assignment from Ulfric. In order to receive the next hold that needs to be liberated, you always start by talking to Ulfric at the Palace of the Kings in Windhelm. Ulfric will acknowledge any progress you have made so far, including possibly giving you a new title and/or reward. He will then tell you which hold needs to be conquered next, along with some explanation for why that hold is the next priority. The next step is to travel to the Stormcloak Camp located in the targeted hold. The location of the camp has been added to your map, but normally it is an undiscovered location, meaning that you cannot fast travel to the camp. Once in the camp, you need to find Galmar Stone-Fist, who is found in the main tent of the camp, poring over an updated map of the war's progress. Selecting the topic "Reporting in" causes Galmar to assign you a specific quest that needs to be completed. In almost all cases, one required quest is "The Battle for <Alias=Fort>". The underlying quest for this battle is always the same, but is simply radiantly assigned to the military fort protecting the appropriate hold. In each case, you need to travel to the fort and help kill all Imperial soldiers present in the fort; your screen will update regularly with the fraction of soldiers who still need to be killed. Your first assignment in the Liberation of Skyrim is normally to liberate Falkreath Hold. In addition to telling you have free rein to kill Imperials as you see fit, Ulfric tells you to report to Galmar Stone-Fist at the hidden Stormcloak camp. The only quest that needs to be completed in Falkreath Hold is Rescue from Fort Neugrad. After you complete Rescue from Fort Neugrad, your journal will tell you to return to Ulfric, so head back to Windhelm and enter the Palace of the Kings. Talk to Ulfric and he will congratulate you, and give you the title "Bone Breaker" and a leveled weapon as well as the permission to buy a house in Windhelm. He will then tell you to head to the Stormcloaks camp in the reach. Go to the camp, and enter the large tent and report in to Galmar, he says that the steward in Markarth is secretly a Talos worshipper and you might be able to find some proof and then "convince" him to help the Stormcloaks. This starts the Compelling Tribute quest. After completing Compelling Tribute, head back to Galmar, who will thank you and give you some leveled gold. Then report in to him and he will tell you that you are going to Fort Sungard, to take over it, he will tell you to go and meet the men preparing for the attack. This will start the next quest The Battle for Fort Sungard. After completing The Battle for Fort Sungard, return to Ulfric in Windhelm and speak to him. Ulfric thanks you for liberating the reach, and then gives you your new title of "Snow-Hammer" (unless you completed Season Unending) and a leveled shield. He then tells you to go to the Hjaalmarch Stormcloak Camp. Head to the camp and report in to Galmar as usual, he will tell you that you have to deliver some false orders to the imperial legate in Morthal, but first you will have to get some orders to be forged. He says the inns at Rorikstead and Dragon Bridge are frequent stops for imperial couriers. This starts the next quest A False Front. After Completing A False Front, return to Galmar at the Hjaalmarch camp and report in. He will congratulate you give you some leveled gold, he will then tell you to meet the men preparing to attack Fort Snowhawk and to take it over, this will start the quest The Battle for Fort Snowhawk. Ulfric will Give you the title "Snow-Hammer" and a leveled shield. He will tell you to go to the Pale Stormcloak Camp to help reclaim The Pale, and he will tell you not to forget it's your fault the Imperials have control of The Pale. Head to the camp and speak to Galmar. Galmar will tell you to meet the Stormcloaks preparing for a attack on Fort Dunstad. This starts The Battle for Fort Dunstad. Go to Windhelm and speak to Ulfric, he will tell you to go to their Camp in The Rift and tells you that he holds you responsible for the situation. Head to the camp and speak to Galmar. He will tell you to meet the Stormcloaks preparing to attack Fort Greenwall. This starts The Battle for Fort Greenwall. Go to Windhelm and speak to Ulfric, he will tell you that while it may not have seemed that bad to give it up, he now has to waste troops on getting it back. He then sends you to the Winterhold Stormcloak Camp. Head to the camp and speak with Galmar. He will tell you to meet the Stormcloaks preparing to attack Fort Kastav. This starts The Battle for Fort Kastav. After completing the previous quests, return to the Palace of Kings in Windhelm and report your success to Ulfric. He will congratulate you and declare you "Stormblade". He will give you a leveled Cuirass and a full suit of Stormcloak officer armor. He will then tell you that the Stormcloaks will take Solitude soon, and that you should report to the Haafingar Stormcloak Camp for further orders. Once you arrive, find Galmar as usual and report in, he will tell you to meet the soldiers preparing to attack Fort Hraggstad and to take the fort, this will start the quest The Battle for Fort Hraggstad. After completing The Battle for Fort Hraggstad, return to Galmar at the camp for further orders, he will simply tell you that the Stormcloaks are taking the capital, and tell you to meet the brothers staging for the final attack. The Battle for Solitude will initiate. After the Battle for Solitude, Ulfric will give you a leveled sword (even if you didn't kill General Tullius) and then ask you to stand at his side while he gives a speech to the men. Whether or not you accept, he will ask you to at least walk out with him. If you decide not to participate in the speech, Ulfric will go directly to thanking the soldiers. In the speech Ulfric will mention you, then go on to thanking the soldiers for all that they have done. He will then declare that he cannot accept the title of high king, until the moot declares him such. A soldier will then yell "what about Jarl Elisif?" Ulfric will then ask her if she will forsake the Empire and swear loyalty to him. Elisif agrees, and Ulfric announces that she will remain Jarl of Solitude. After the speech Ulfric will turn to Galmar and ask how he did, and after some talking Ulfric will thank you and leave with Galmar. This quest and Reunification of Skyrim are different radiant versions of the same quest. However, Liberation of Skyrim has more options because you may have been on either the Imperial or Stormcloak side during Season Unending. Sometimes you cannot say "Reporting in." to Galmar at the Stormcloak camps and therefore cannot advance the quest. Simply reload a previous save. If that doesn't work, attack him until he collapses, then sheathe your weapons. This may work, although you will get a bounty. After attacking Galmar Stone-Fist, he may start attacking you on sight and cannot be spoken to. Move to another location, rest/wait until the camp respawns and return. Open the console and write setstage CWMission04 10 to begin the Falkreath quest. Starting Season Unending may make this issue unsolvable. Sometimes when trying to report to Ulfric Stormcloak, you are unable to talk to him and can't advance further in the quest. Use the console to select Ulfric, disable him, then enable him again. If this occurs immediately following Battle for Whiterun, use the console command SetKeywordDataForLocation 16772 CWOwner 2. Failing all of the above, you can use the console command setstage CW 4 to skip the dialog and move on to the next stage of the quest. On the Switch version, re-entering Whiterun should correct the quest flags. After the quest has been completed and Ulfric has given his final speech, Elisif may not be available in the Blue Palace. If you have a quest that has her as its target, the target will appear on the world map in Whiterun hold, but pathfinding will indicate that she is in Solitude. This blocks several quests from working properly. ? Completing Bound Until Death after this quest moves Elisif to the Blue Palace. The "Liberate Haafinger" and "Report to Ulfric Stormcloak" objectives will not be marked as completed in the quest log once the quest is complete. ? Ulfric was intended to be unwilling to start the attack on Solitude if the Emperor is visiting Skyrim. "We're ready to march on Solitude, but the Emperor's visiting! The goddamned Emperor! And, as much as I'd like to kill the man myself, we can't risk an all out war with the Empire. We'll bide our time for now..." However, this will not function because it reacts to Skyrim:Bound Until Death rather than Skyrim:To Kill an Empire. This won't cause a conflict, as Galmar's failsafe works properly with the correct reference. ? Only stages and objectives relevant to the Liberation of Skyrim (rather than Reunification of Skyrim) are included in the table. 1 I will help Ulfric Stormcloak liberate Skyrim from Imperial control. 255 Finishes quest We have won the war by taking Solitude and killing General Tullius, and have liberated Skyrim from Imperial control. This page was last modified on 22 December 2018, at 08:56.